Encoder, decoder and their related message types for HTTP. An HTTP chunk which is used for HTTP chunked transfer-encoding. The last HttpChunk which has trailing headers. An HTTP message which provides common properties for HttpRequest and HttpResponse. Decodes an HTTP header value into Cookies. Encodes Cookies into an HTTP header value. A ChannelHandler that aggregates an HttpMessage and its following HttpChunks into a single HttpMessage with no following HttpChunks. A combination of HttpRequestEncoder and HttpResponseDecoder which enables easier client side HTTP implementation. Compresses an HttpMessage and an HttpChunk in gzip or deflate encoding while respecting the "Accept-Encoding" header. Decodes the content of the received HttpRequest and HttpChunk. Decompresses an HttpMessage and an HttpChunk compressed in gzip or deflate encoding. Encodes the content of the outbound HttpResponse and HttpChunk. Provides the constants for the standard HTTP header names and values and commonly used utility methods that accesses an HttpMessage. Standard and CORS HTTP header names. Decodes ChannelBuffers into HttpMessages and HttpChunks. Encodes an HttpMessage or an HttpChunk into a ChannelBuffer. The request method of HTTP or its derived protocols, such as RTSP and ICAP. 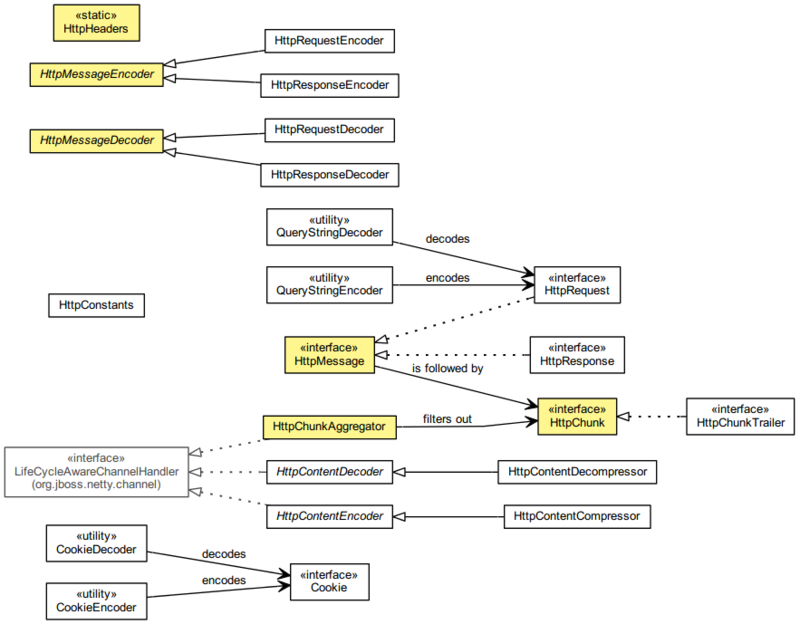 Decodes ChannelBuffers into HttpRequests and HttpChunks. Encodes an HttpRequest or an HttpChunk into a ChannelBuffer. Decodes ChannelBuffers into HttpResponses and HttpChunks. Encodes an HttpResponse or an HttpChunk into a ChannelBuffer. The response code and its description of HTTP or its derived protocols, such as RTSP and ICAP. A combination of HttpRequestDecoder and HttpResponseEncoder which enables easier server side HTTP implementation. The version of HTTP or its derived protocols, such as RTSP and ICAP. Splits an HTTP query string into a path string and key-value parameter pairs. Creates an URL-encoded URI from a path string and key-value parameter pairs. The internal state of HttpMessageDecoder.